Civil conflict is the most prevalent form of armed conflict in the world today, but this significant driver of food and income security has been largely missing from studies of fisheries. 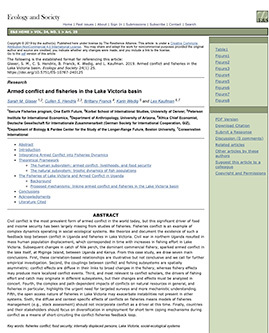 Fisheries conflict is an example of complex dynamics operating in social-ecological systems. We theorize and document the existence of such a feedback loop between conflict in Uganda and fisheries in Lake Victoria. Civil war in northern Uganda resulted in mass human population displacement, which corresponded in time with increases in fishing effort in Lake Victoria. Subsequent changes in catch of Nile perch, the dominant commercial fishery, sparked armed conflict in the lake itself, at Migingo Island, between Uganda and Kenya. From this case study, we draw seven main conclusions. First, these correlation-based relationships are illustrative but not conclusive and we call for further empirical investigation. Second, the couplings between conflict and fishing subsystems are spatially asymmetric: conflict effects are diffuse in their links to broad changes in the fishery, whereas fishery effects may produce more localized conflict events. Third, and most relevant to conflict scholars, the drivers of fishing effort and catch may originate in different subsystems, but their changes and effects must be analyzed in concert. Fourth, the complex and path-dependent impacts of conflicts on natural resources in general, and fisheries in particular, highlights the urgent need for targeted surveys and more mechanistic understanding. Fifth, the open access nature of fisheries in Lake Victoria may exacerbate instabilities not present in other systems. Sixth, the diffuse and context-specific effects of conflicts on fisheries means models of fisheries management (e.g., stock assessment) should not incorporate conflict as a driver at this time. Finally, countries and their stakeholders should focus on diversification in employment for short term coping mechanisms during conflict as a means of short-circuiting the conflict-fisheries feedback loop.